The behavior chart has been taken out with yesterday's trash. But I still have to go back to school and face all those kids and all their BEHAVIORS!! Now what?! After the post I wrote a while back about Never Using A Behavior Chart Again, I still get tons of emails, questions, comments, stories, pleas, suggestions, etc. I have really loved hearing from everyone and I have heard so many amazing stories from other parents and teachers. But since I was replying to so many emails, I decided to write several posts about managing classroom behaviors in the absence of a behavior chart. These are ideas that can be easily used in classrooms or homes with varying degrees of implementation depending upon need, experience, and comfort level. BUT, but what about those few little people who still can't quite follow directions. The ones who try your patience, who struggle no matter what you do. The ones who disrupt every lesson, hallway line, and activity. We are always going to have kids who have issues beyond what a whole class system can manage, we just need to help them in a different way. 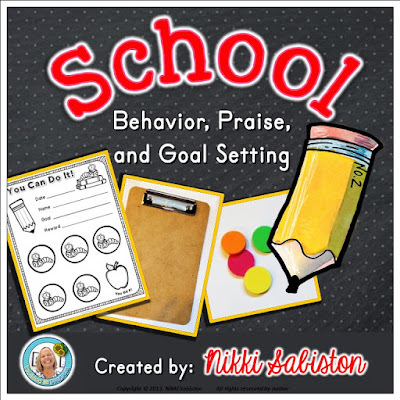 I have been using an individualized goal setting system the last couple of years that I have found to be extremely successful in helping individual students make behavior changes. It concentrates on the individual needs of the child by setting specific goals and helps him to focus on changing behaviors in small, manageable chunks. 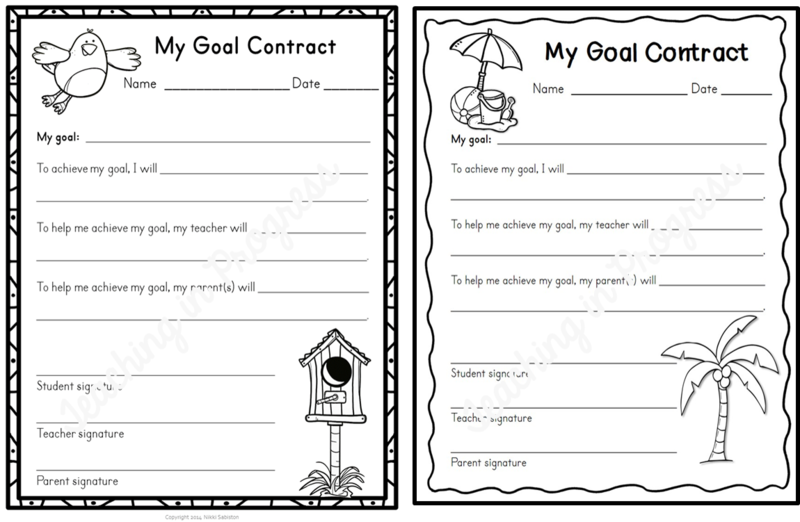 First, we use a goal setting form to focus in on the desired behavior. We talk about how the child, teacher, and parents will work together to help him find success. 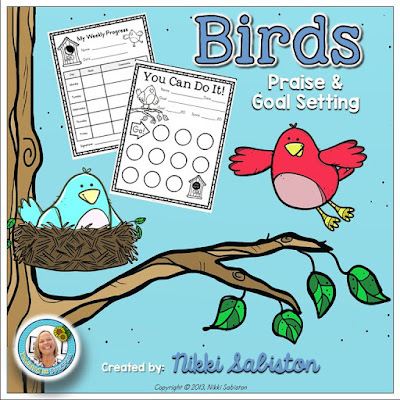 When helping to create and meet behavioral or academic goals with kids, I have discovered a few basic tenets for praise and goal setting that are helpful to keep in mind. 1. Only focus on one or two goals at a time. Really, one goal is best. More than two is overwhelming and none of the goals will receive enough focus and attention to become internalized or automatic. Chances are, these kiddos have some attention problems to begin with, so throwing a handful of goals at them is an exercise in futility. Although, sometimes it's REALLY hard to choose only ONE behavior goal! 2. Allow the student to help choose the goal. He must have ownership of the goal or he will not be invested in reaching it. The child has to really want to make a change and giving him a goal that he is not interested in working towards is a recipe for failure. You might have to do some resourceful psychological maneuvering to get the kid on board. Be creative! 3. Make sure the goal is well understood by the student. The desired behavior should be broken down into each identifiable element and taught explicitly, step by step with very clear expectations. I usually try to meet with the child one to one when the class is busy elsewhere to model the expectation exactly and talk with him about it. 4. Goals should be very specific. “Be good” is not an appropriate goal because it isn't clearly defined. ‘Sit calmly with hands and feet to yourself on the carpet during lessons’ is a more specific, definable, and attainable goal. Be sure to break that down so the student knows exactly what that looks and feels like and how to achieve it. If the behavior is complex, you might break it up into two or three separate goals and reach them one at a time. If you've got a kid who is all over the place, talking, calling out, etc. during mini lessons, you might just start with 'stay in your own space' as a start. Once that is mastered, add in 'raise your hand to speak during a group lesson' and keep working to pull back each undesirable behavior. 5. Accept close approximations initially to build confidence. When goals are first introduced, attempts and close approximations should be honored in order to provide an initial measure of success. As the student improves, more complete compliance is expected. This is how they learn what it takes to get to the expected behavior. Scaffolding, if you will. 6. Praise the behavior specifically, noticing effort and results. Again, be specific and praise the behavior, not the child. Instead of 'You were so good!' be more specific about the actual behavior - 'I noticed that you listened so well without calling out during our math lesson!' "You kept your hands and feet to yourself during the entire recess time!" 7. Allow students to self assess. Before you pass any judgement or give any praise, ask the student how it went. Most of the time, I find that kids are either too hard on themselves and do not recognize progress or they think they have done very well when they really haven't met the goal. In either case, asking the child how they felt about it will reveal volumes. 8. Keep it positive, optimistic, and consistent! Once we set a goal, I make sure we have a way to track progress. I use fun tracking sheets with stamps, stickers, bingo markers, etc. to keep track of progress. I never track failures to meet the goal. They never get a strike, or a sad face, or have something x'd out because they exhibited a negative behavior. We don't dwell on how often the kid failed to meet the mark or did the wrong thing. This is not about what the kid did wrong, this is about recognizing what the kid did RIGHT. That's not to say that there are no consequences for highly unacceptable behavior. What I mean is that when the targeted behavior is not shown during the time period we are monitoring, there are no negative marks on the progress sheet. The only thing that goes on the sheet is praise for meeting the goal. If the goal was not met, meaning the target behavior was not shown, then nothing goes on the chart. 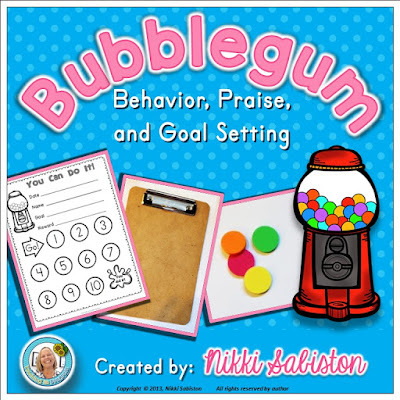 When the behavior goal was met during the specified time period, the child receives praise for the behavior and we chart the progress on the sheet by filling in one of the circles. The ultimate goal is to fill in the entire sheet to earn a reward. The time it takes to complete the sheet is up to you and the child. I have had kids complete it in half a day and some who take 3 days, depending on the child and the goal. But when the sheet is full, the reward is earned. I never give tangible rewards to my students so rewards might be lunch in the classroom with the teacher and a friend, or extra computer time, or maybe something at home that the parents are helping to provide. If a traditional sort of recording sheet isn't working, try something a little different that might interest certain children. If you choose to give this a try, or already use something similar, let me know how it's working or any suggestions to make it more successful! If you would like to try any of the sheets and activities shown in this, you can find them here. Just click on the pictures. These files contain much more than is shown here and more themes are available, with more coming soon. I love this but, question- what are some examples of consequences for negative behavior? I find this hard to envision if there are no negative marks... This is what I seem to struggle with. Thanks! I usually try to ignore the targeted behavior while we are working on this (unless there is hitting, kicking, etc.) But if the behavior is repeatedly interrupting learning, it has to be addressed. For example, if a kid is talking excessively when we are having a mini lesson on the carpet, I would ask her to leave the carpet. It might be to sit near the carpet so they can still see, or to go their seat for a bit, or maybe to the 'Thinking Chair.' If the behavior is throwing crayons, then I would have that kid help clean the classroom floor. If someone is yelling out instead of waiting to be called on, I will typically ignore the first time or two, then give a verbal reminder to stop, then ask the student to step away from the group for a minute to pull it together. I tell the kids that if they are unable to be a productive member of the group, they will have to leave the group for a few minutes to refocus. If they make a mess, they clean it up. If they damage a relationship, they must try to repair it. If they take something that doesn't belong to them, they return it and work to regain our trust. It doesn't always work, but it helps the kid learn to fix what he breaks instead of just get punished for breaking it. I love this but, question... What are some examples of consequences for negative behavior, as you mentioned? I find this hard to envision if there are no negative marks.. This is what I seem to struggle with. Thanks! I will be moving to third grade from first last year. I got rid of my behavior chart last year and focused a lot more on logical consequences and character education. I like the idea of goal planning for third grade but wondering how long do you think you should wait to get to know the kids and where they can improve before setting up the goal planning sheet? Typically it takes 4-6 weeks to nail down procedures and expectations with a new class. I would give it that long at least. Although, if you've got a kid who is really just not settling down across settings, I think it would be good to nip that early. As a teacher of students with emotional and behavior disorders (yes, those kids that can't follow directions, talk out, disrupt, etc.) I applaud your style of handling classroom behaviors! It is refreshing to see those color charts disappearing so that our students aren't being singled out for their behaviors! The dignity aspect is so key. So refreshing to read this! Hooray for no more color charts. Your suggestions and ideas are terrific. Thank you for sharing. Awesome blog post!! I threw out my clipchart a year ago and haven't looked back! We do a super improvers wall that's from whole brain teaching but works on individual goals just like this!! Thanks for sharing! thank you, thank you, thank you!!! I too threw my behavior chart out years ago because I hated how it made kids feel. I love your take a break corner. I had a time out desk, but this is much more positive. And I love your behavior sheets - much cuter than what I used!!! I'm heading to TPT to buy your products for this coming year. I loved this! I work as a behavior therapist with children with autism, and ignoring the behaviors I don't want to see and greatly encouraging the ones that I do want to see sounds like what you do, I love it! It's so cool to see it applied in a classroom! I do have a question though: how do you keep the reward paper a secret? I'm trying to rack my brain and I feel like if you want to award the student when they're doing it so they can associate the reward with the "good" behavior you'd want to do it quickly...but yeah! How do you keep it a secret? I sometimes keep it at my desk, sometimes the kid keeps it on a small clipboard in his desk, or sometimes, they are kind of proud of their success and they don't want to hide it. I once had a girl ask me to tape it to her desk! With a few kids, I have a little secret signal and when I give the signal, they know they were successful (or they can give me the signal when they feel they were successful) and they know the signal means I will mark the sheet when I get back to my desk. I LOVE this! My son's 2nd grade teacher uses a color clip chart, and he is nearly always on yellow, orange or red (all the negative colors). Now he has a daily report chart where he is asked to color his own level in for the day and someone checks it to make sure it is correct (there were some, ahem, discrepancies between his report and what actually happened), and they are supposed to comment on what specifically caused the problem. If there's a substitute, it doesn't get done. If he gets sent to the office near the end of the day, it doesn't get filled out. They are placing the responsibility on him to do it, I guess. Now we are getting the true report when it is completed, but the comments are very general such as "trouble paying attention", "not following directions", so we have no concept of when/during what activity, etc. the behaviors occurred. Then there are the frequent frownie faces on the chart coming home. We strongly suspect that anxiety over this public chart is one reason he has so much trouble keeping it together. He is highly intelligent, at or above grade level in all areas, has high-functioning autism and ADHD, is medicated, and in an integrated mainstream classroom with I believe 17 other kids, yet the behaviors continue. We are at our wit's end. He is very sensitive to criticism and has very few classroom friends other than those kids who are also having behavioral issues. Thank you for understanding that some kids will need individualized, PRIVATE behavior plans and that shame can be a powerful factor in both motivation for some kids and anxiety for others. I LOVE this concept! I am a first year teacher and will be teaching in 1st grade. 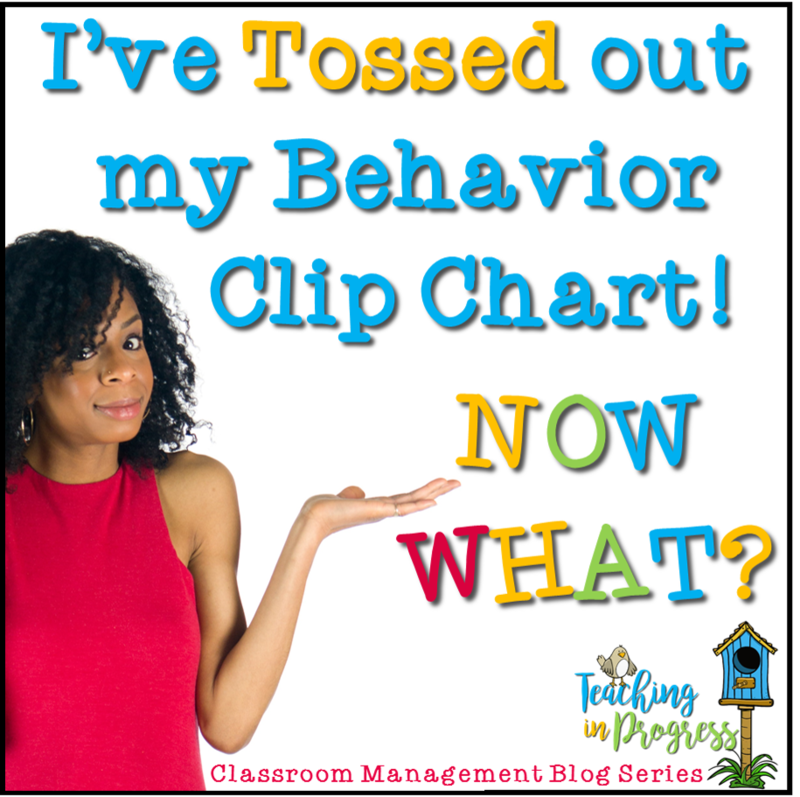 I know that classroom management is an area that I need much improvement in, and am opposed to the clip chart despite its familiarity and the lack of preparation that it requires. I just have a few questions! 1. With teacher assistance, do you feel that goal setting such as this is successful with 1st grade? I have little experience with this age group. 2. How do you communicate progress with parents? Are they notified daily? 3. I read in a previous comment that you do not start these sheets until about a month into the school year to allow time to build relationships with students and identify appropriate goals. What type of behavior management, progress monitoring and parent communication do you do prior to this? 4. Lastly, just so that I understand correctly do the students add to their sheets or do you color in the area? How do you keep students from trying to add to their sheets without your permission? I hope I can answer well and provide some guidance! 1. I taught 1st grade for 16 years and developed this for my first grade students! 2. If I have developed a personalized plan for a child, I communicate with parents as often as we agree upon. Might be daily, maybe once a week. I like to only communicate successes. If negative behaviors re significant or out of the norm for the child, I will communicate that as well. 3.I teach procedures constantly, use Take A Break, use books and scenarios to teach decision making and self regulation, and do a weekly parent newsletter. 4. The child adds to the sheet after I approve it. I keep track of the sheet so I can tell if someone is trying to fudge it! I often use a particular kind of marker or sticker that I keep in my possession and only give it to the child upon a successful attempt. I love your ideas! I'm just wondering if you have a whole class reward system? 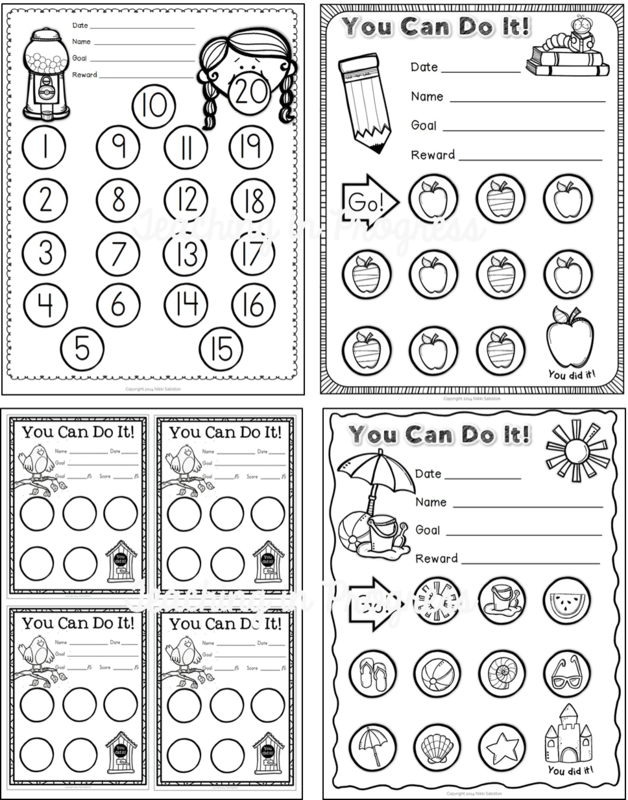 Or if you have individual reward systems for kids that are not using a goal chart? The goal setting packs each have a whole group component. Right now I am compiling all the whole group sets into one bundle. Hopefully it will be posted in a few weeks. Thanks!! I love this idea! Do you have an individualized behavior goal for each student in your class? If so, what kind of goals do you create for your students who always do an excellent job? I have quite a few who would really benefit from this, but I am not sure if I should do it for the ones who always do a good job. Thanks! I'm clicking on the pictures and it is just enlarging the images. It is not taking me to the individual charts or a file. Help?